Dr. Shoab Khan has a Ph.D. in Electrical and Computer Engineering from Georgia Institute of Technology, Atlanta, GA, USA. He is a founding member of Center for Advanced Studies in Engineering (CASE) and CEO of Center for Advanced Research in Engineering (CARE). 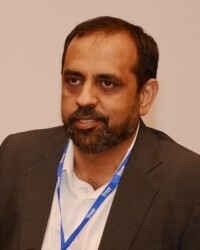 He is a professor of electrical and computer engineering at the College of Electrical & Mechanical Engineering, National University of Sciences and Technology (NUST). Dr Khan is actively involved in research and development and has 5 awarded US patents and 160+ international publications. He has more than 17 years of industrial experience in companies like Scientific Atlanta, Picture Tel, Cisco Systems, and Avaz Networks. He has been awarded Tamgh-e-Imtiaz, the Presidential Award for his contribution in the field of Engineering.